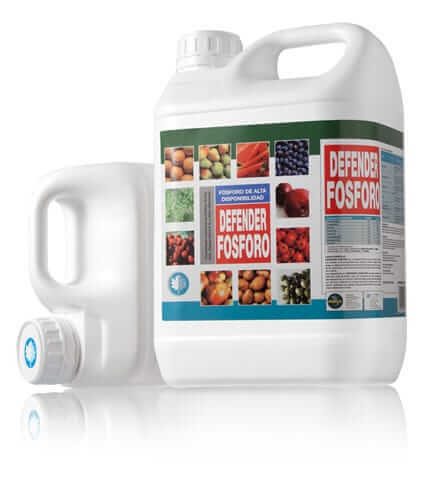 Defender P - Kenya Biologics Ltd.
DEFENDER P is a foliar fertilizer rich in phosphorus, which is combined with potassium and microelements for maximum vegetal plant nutrition. Phosphorus is a critical element for plant nutrition. As a component of ATP, phosphorus is needed for the conversion of light into chemical energy during photosynthesis. Since ATP takes part in biosynthesis of many biomolecules, phosphorus is important for plant growth as well as flower and seed formation. The uptake of available phosphorus by plants is affected by abiotic factors such pH and temperature. A decrease in the availability of phosphorus in the soil can directly be noted in form of a plant deficiency, which is particularly serious in rapidly growing crops such as some fruit trees, cereals or potato. Application of DEFENDER P ensures an adequate level of phosphorus (P) in plants during moments of maximum necessity. DEFENDER P is specially formulated to be rapidly absorbed by leaves or roots to ensure maximum nutritional benefits, generating elevated harvest yields and high fruit quality. DEFENDER P is recommended for prevention and overcoming of phosphorus deficiencies and for improving crops growth. Apply using enough water to completely wet all foliage. DEFENDER P can be also applied in drip irrigation. DEFENDER P is stable for at least three years since manufacturing date. Store in the closed original container in a cool and ventilated area. DO NOT store for prolonged periods in direct sunlight. Keep away from food, drink and animal feed. Keep out of the reach of children. DEFENDER P is highly compatible with most pesticides and fertilizers. For application with plant protection products follow pesticide label directions and make jar test for compatibility. Contains active phytohormonal compounds at 0.5% by mass*. Contains the following elements at 0.15% by mass*: boron (B), carbon (C), iron (Fe), manganese (Mn), molybdenum (Mo) and zinc (Zn). Horticultural crops or vegetables 300 – 400 Apply according to deficiency level or to improve quality and colour of fruits. Grapewine, kiwi 300 Apply since beginning of setting at 15-20 days intervals. Last application should be done 20 days before harvest. Fruit trees 200 – 400 Apply since the end of petals falling and repeat every 15 days. Last application should be done between 2 and 3 weeks before harvest. Citrics 300 Apply in buds growing of spring and fall. Blueberry, raspberry, strawberry 300 – 400 Apply since beginning of flowering and repeat at 7 to 10 days intervals. Potato 200 – 400 Apply since beginning of tuber at 15 days intervals.